Maximum altitude gain: 5,545m.at Kalapatthar. 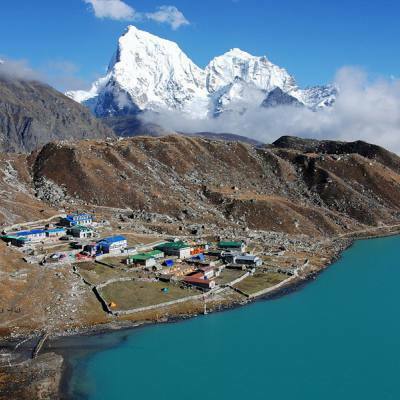 Everest Gokyo Lake Trek is the adventurous trek in peaceful and undamaged Gokyo valley. It offers the undamaged trekking trail into the Everest region. 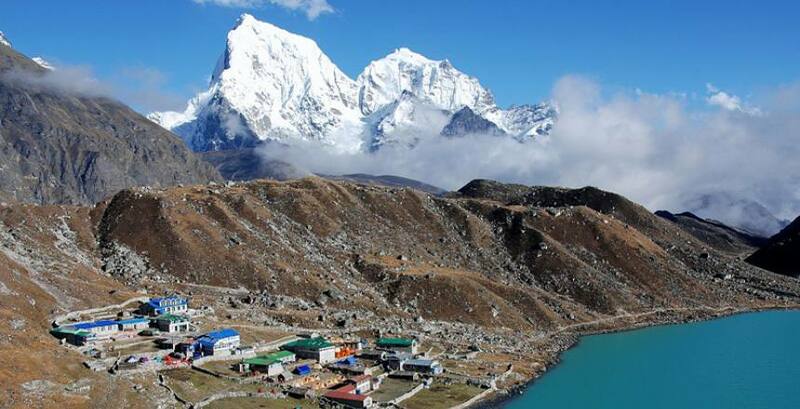 Everest Gokyo Lake trek provides the fantastic vistas of the snow clad mountains, rich culture of the Everest region, views of glaciers like Ngozumpa Glacier- the largest in Nepal's Himalayas, various flora and fauna, wild animals and birds etc. In this trek, you cross the high pass of Chola Pass at the altitude of 5330 meters. In this trek, you get the opportunity to see an eyeful view of the Mt. Everest at close range along with other mountains like Cho Oyu, Lhotse, and Makalu which are clearly visible from Gokyo Ri above Gokyo Lake. The view of tremendous ice ridge between Cho Oyu and Gyachung (2922m.) located in this region is another attraction of this trekking trail. During the Everest Gokyo Lake trek, you can also get insight into the culture and lifestyle of the Sherpa people, the major inhabitants of this region who are famous for mountaineering in the world. The adventurous Everest Gokyo lake trek begins with a scenic flight to Lukla from Kathmandu. Lukla is the entry point to the Everest region. From Lukla, you start our trekking following the Dudh Koshi River valley. This trekking trip provides the trekkers ample opportunity to explore the amazing destination and its impressive sight, which is beyond human imagination. During the trek, you pass through the lush forest of rhododendron and pine, Dudh Koshi valley, Sagarmatha national park, high passes, waterfalls, beautiful Sherpa villages like Phakding, Namche Bazaar, Tengboche, etc. Sagarmatha national park is the UNESCO listed heritage site where you can find various flora and fauna and wildlife like snow leopard, red panda, Himalayan Thar etc. in this trek you enjoy the warm greeting and the friendly behavior of the Sherpa people in different villages. The best time to go for the Everest view trek is from mid-March to May and September to Mid-December. Trek is total mountain adventure journey to roof of the world, opportunities for outstanding photographic and many chaos encounter of typical culture in highland. Day 01Arrival in Kathmandu You arrive in Kathmandu and you meet our representative in the airport who will take you to your hotel in the heart of Kathmandu. Overnight at hotel. Day 02Kathmandu City Tour Today you visit different historical and cultural sites of the Kathmandu valley with our guide. In the morning after having breakfast you go visit Buddhist and Hindu temples Boudhanath, Pashupatinath, Swayambhunath, which reflect the local culture and tradition of Nepalese society. Then in the afternoon you visit Kathmandu Durbar square and Patan durbar square. In the evening you will return to the Hotel. Day 03Katmandu to Lukla - Trek to Phakding (2700 m) In the morning you have a scenic flight of 30 - 35 minutes to Lukla (2800m) from Kathmandu. During the flight you can see the snowcapped mountains and greenery field below. From Lukla we start our walk and head to Phakding passing through the forest and following Dudh Koshi River. In Phakding you can climb to the Gompa to see your first view of the high peaks. O/N at Phakding. Day 04Phakding to Namche Bazaar (3440 meters) From Phakding the trail follows the Dudh Koshi River and reaches Zamphuti. From there we can see excellent views of Thamserku peak. Then the trail climbs to Chomoa, the site of an agricultural project, an interesting place to have a look around and gain an insight into the farming way of life of these people. From Chomoa, the trail again climbs to Monjo (2840m.) and enters the Sagarmatha (Everest) National Park (1148sq km, established in 1976). Walking some distance uphill you will be at Jorsale (2830m.) and after a long climb with views of Mt. Everest peeking over the ridge of Nuptse (7879m.) the trail reaches the street of Namche Bazaar. Stay at Guest house- Lunch, Dinner and Breakfast. O/N at Namche Bazaar. Day 05Acclimatization in Namche (3440m.) Today we take rest for the proper acclimatization with some excursion. We can hike to the Everest View Hotel, the ideal place to overview some of the outstanding mountains such as Mt. Everest, Ama Dablam, Thamserku, Lhotse etc. You can walk around the Khumjung valley, Hillary School and Khunde Hospital and then return back to Namche. In Namche Bazaar you can spend some time interacting with the fun-loving Sherpa and Rai people. Day 06Namche to Phorste Thanga (3680m.) This day we leave Namche bazaar and walk for some time along the ridge. We climb steeply out iof the valley through the forest of rhododendron and Juniper. We cross yak Kharkas which is the summer settlements of Sherpa. And finally we reach Phortse Thanga where we stay overnight. Day 07Phorste Thanga to Machherma (4470m.) This day at first we climb through a ridge and then descend to the valley Kengtega enjoying the panorama of the mountains. then we again climp up towards Cho Oyu and descend to a river and again climbs steep to the terminal moraine of the Ngozumpz glacier. We will reach at Machherma by early noon. Day 08Machharma to Gokyo (4800m.) Today the trek takes us at one of our final destination, Gokyo (4790m. ).we climb through a ridge Chorten from where we can see fabulous view of both down the valley and of the Mt. Kangtega, Thamserku, and northern part to the Cho-Oyu (8153m.). Day 09Trek to Dole (4500m.) Today you will trek back to Dole as the same valley. Day 10Dole to Namche (3440m.) We descend on the steep path to the Dudh Koshi and then climb up to Namche Bazaar. Overnight at guesthouse. Day 11Namche to Lukla (2840 m) Finally we return to Lukla where the trek began, which will seem like a lifetime ago. Enjoying time to reflect on the trek as a group and the personal achievement of all those who took part. Also giving you time to explore the town. Overnight at guesthouse. Day 12Flight to Kathmandu Enjoying your last glimpse of the mountains you have recently visited for one last time on the 35 minute Scenic flight back to Kathmandu. On arrival in Kathmandu we are met and transferred back to our starting hotel. Overnight at hotel. Day 13Departure. The trip ends, our Airport Representative will drop you to the Kathmandu International Airport for your flight departure from Nepal.